• 1.High-speed intelligent 4 USB ports(1.0A-2.1A) and 4 AC sockets(10A Max. ): Fast charging tablets and phones simultaneously. You don't have to worry about the outlet distribution for the maximum speed will be automatically varied according to the charging devices. 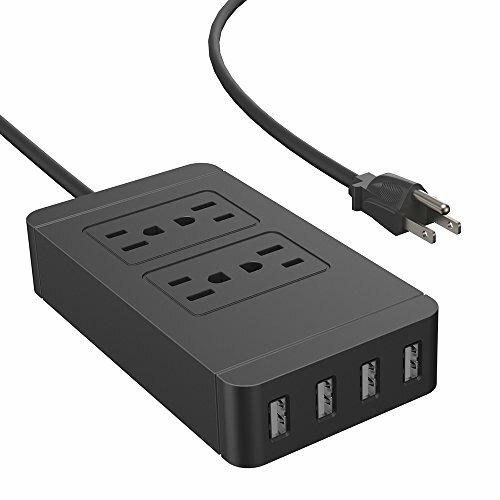 • 2.The Power Strip/outlet supports US standard plug. • 3.The Power Strip supports high-power electrical device such as induction cooker, refrigerators, air conditioners etc. • 4.It has anti-surge, overload protection. • 5.Safer and More Durable: Better conductivity and thermal performance are ensured by inner copper conductor. • 6.Adopting 0.75 standard square copper wire core, the wire will not turn soft even after long time use under 2500W high power. • 7.Its housing is made of special high-strength fire-retardant material.